such as churches, non-profits, clubs and associations. 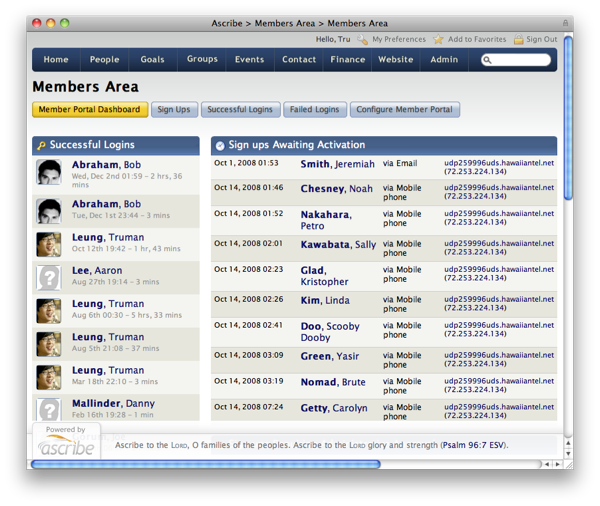 Ascribe is an online CRM and website builder. 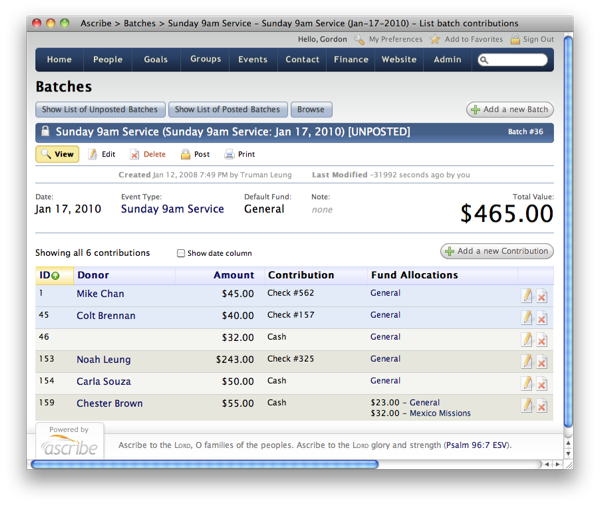 It also lets you do email marketing and donations tracking. It’s easy to use and really affordable! Ascribe helps your staff do their jobs quicker, easier and efficiently. 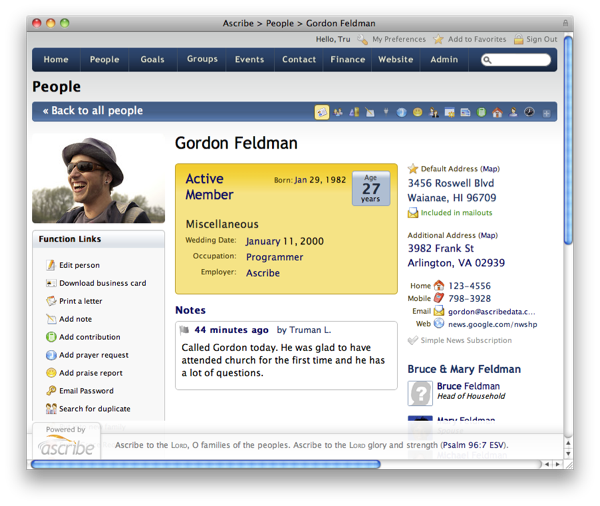 Web Based. Always On. No Installation. Ascribe is web-based so you can access it using any browser on any computer or tablet device with an internet connection. Work from home, office or cafe. Take Ascribe on the road using a 4G enabled iPad. No need to wait for office hours. The Ascribe service is alway on. With time-proven, reliable hosting services powering Ascribe, you can rely on our uptime. No need to install any software. We've done already done it. Enjoy. Still using file folders and sticky notes? Confused as to which Excel spreadsheet is most current? Each department maintaining their own mailing list? 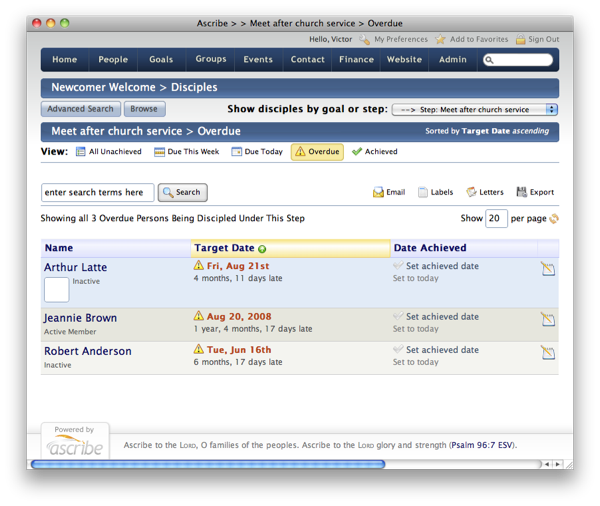 Ascribe lets you maintain a single contact database for your entire organization. When you call someone, you won't have to wonder if you're dialing the most current phone number you have, organization-wide. Get work done, no-fuss and quickly. 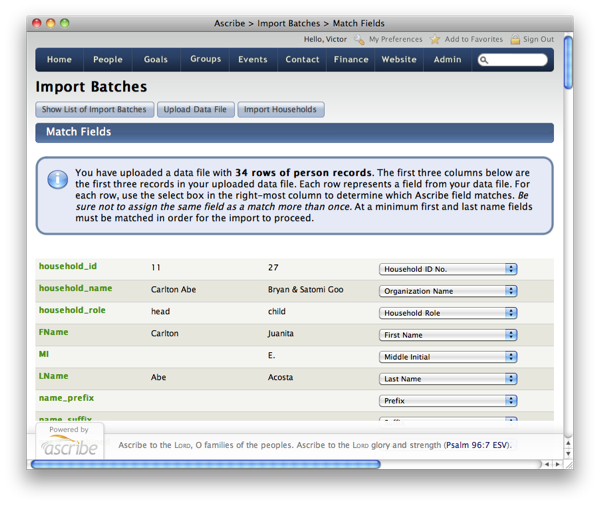 Ascribe has a myriad of functions designed to minimize your effort maintaining data. It lets you save time so you devote more energy towards connecting with people. 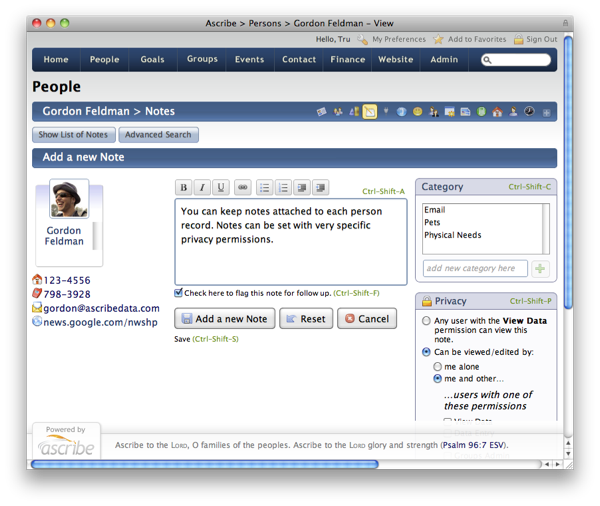 Maintain a record of private notes for each person. Flag notes for certain users to see when they sign in. You might be someone who never forgets a face. Then you'll appreciate that Ascribe lets you upload photos to a person's profile. 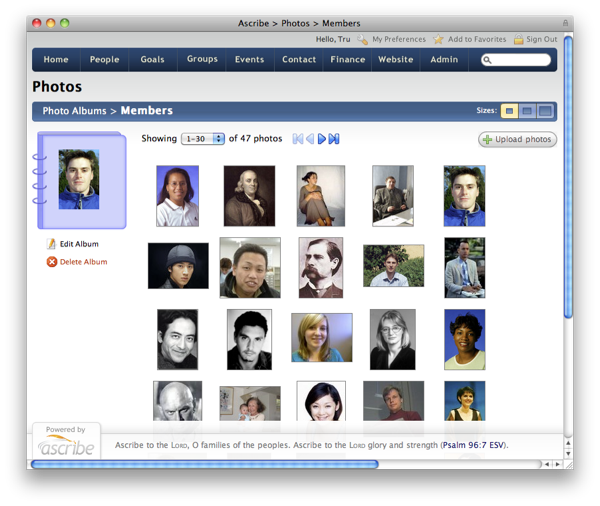 Unlimited photos are allowed per person, household or group. Each staff person and volunteer can track their own todo items. Edit due dates right from the listing. 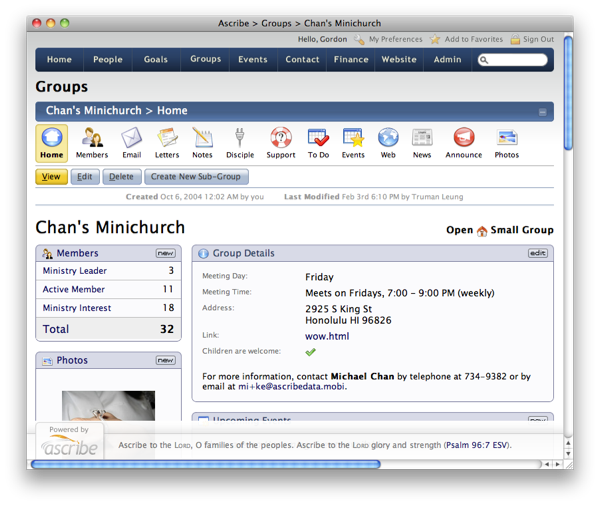 Empower each group or department with online tools to manage information, assign tasks, print labels, send email and build community. Securely track financial giving for each person and household. 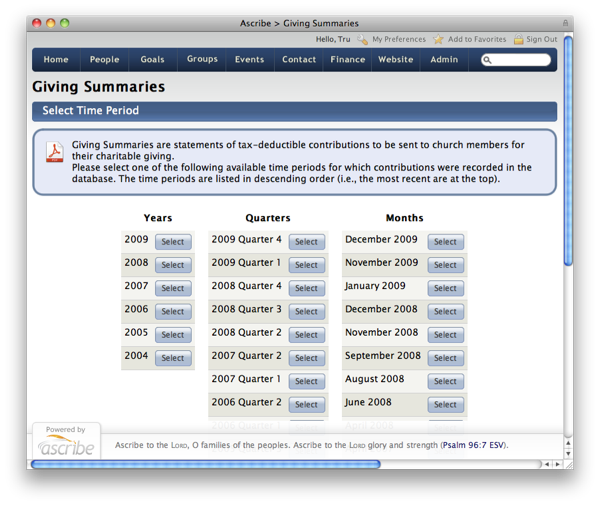 Distribute tax-deductible statements via the web by creating a private members area on your website. Track events across your entire organization sponsored by various groups or departments. 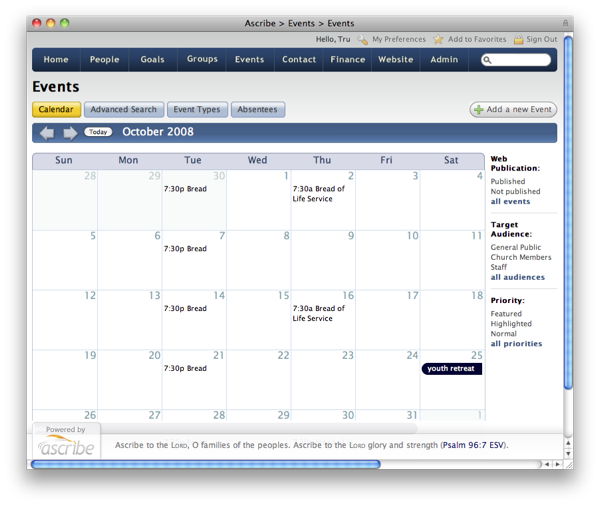 Ascribe supports event attendance taking, online registration and absentee tracking. Securely store documents, images and any type of computer file. Organize files into unlimited folders with a distinct icon. 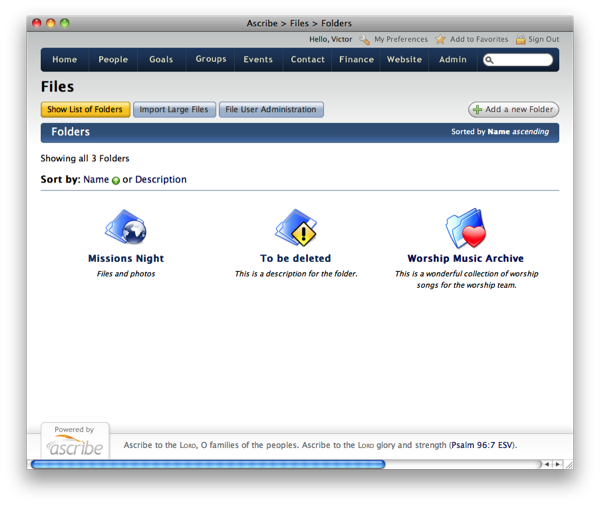 Configure folders to send automatic notifications upon certain conditions. Ascribe's goal module allows you to track a person's progress toward achieving any number of goals established by your organization. Each goal may have multiple steps which when the goal is initiated for a person schedules out a series of target deadlines. 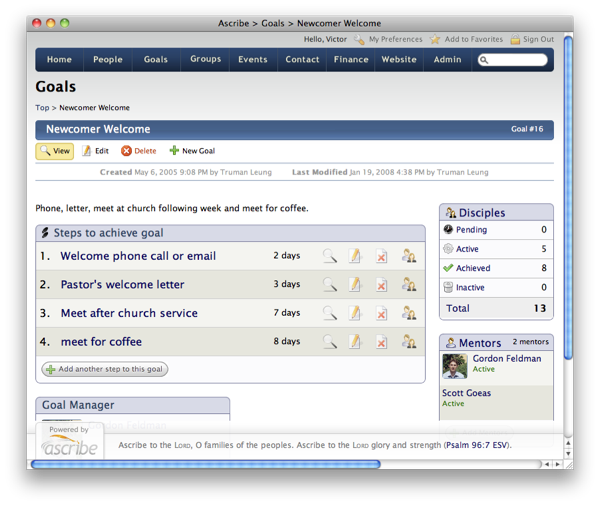 Track people's progress within the goal by step. Any text within Ascribe can be easily edited to whatever you like. Translate to other languages with the help of an online translation service. Ascribe can support many different languages. 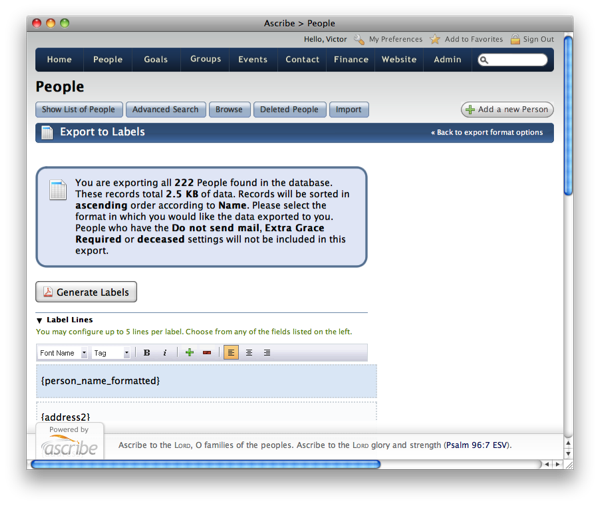 Easily print out mailing labels or name tags by letting Ascribe generate PDF documents for you. 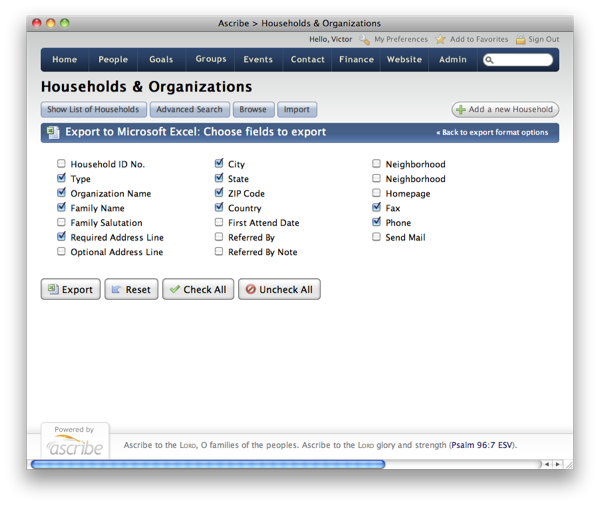 Export data to Microsoft Excel or text file from almost every module. Upload your pre-existing member database using common file formats to quickly import your membership into Ascribe. Update many people records at once based on certain conditions. Or initiate goals or other actions based on search conditions. 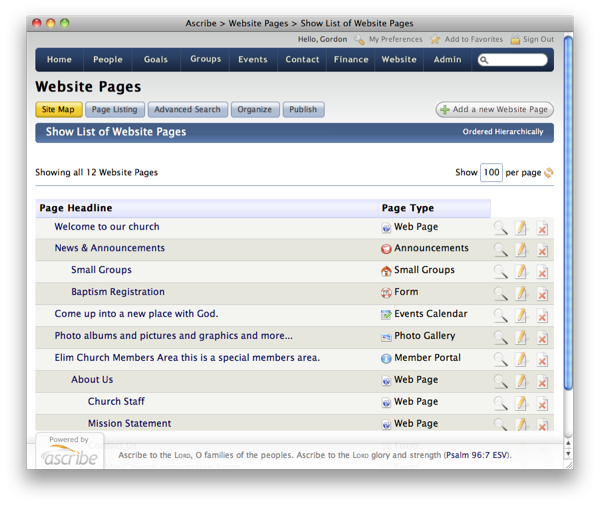 Organize and publish web pages. Publish a members area for your website with a custom "look and feel" to match your web design. Let your members sign up for accounts to update their own member information, browse a member directory, register for events, download their giving statements and more. 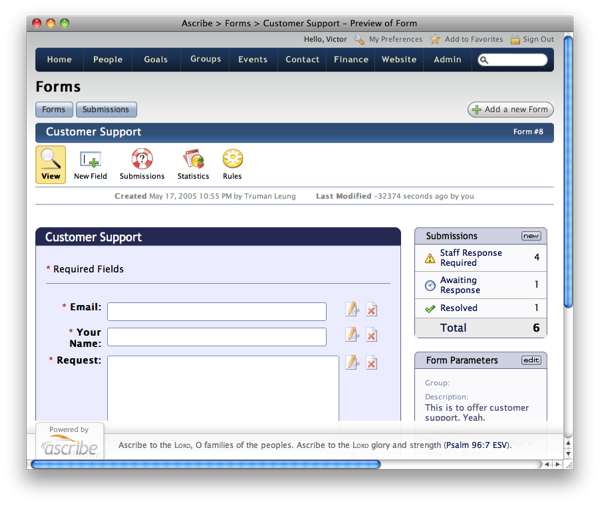 Create forms to capture inquiries from your website. Reply to people who use the form. Use data from the form to create or update person records. Instruct Ascribe to perform automatic actions upon form submission (e.g., send an email, create a task, delete submission, etc.). Set Ascribe to use your preferred date, time and telephone formats and currency symbol. Some software companies choose not to publicly post their prices. But we do. We believe consumers should be able to see plainly see how much they will be charged before having to give up their contact info. Check out our Simple Pricing Plans. This site is powered by the Ascribe. Copyright © 2004-2016 Ascribe Data Systems LLC.